Kendrick Lamar (born June 17, 1987) is a rapper from Compton, California. His music is influenced by Tupac Shakur, Jay-Z, Nas and DMX. He is a member of Black Hippy along with Jay Rock, Ab-Soul and Schoolboy Q. 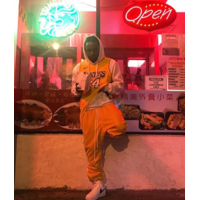 He released an EP in 2009 titled The Kendrick Lamar EP, an aclaimed mixtape in 2010 titled O(verly) D(edicated) and plans to release his debut album Good Kid in a Mad City in 2011.